Cycling in New York City continued to climb last year, according to the latest metrics from NYC DOT [PDF]. The new stats show that while cyclist counts in the center city aren’t increasing as rapidly as they did from 2005 to 2011, Census counts of bike commuters are rising as fast as ever. In 2016, bike counts at the four East River bridges increased 2.3 percent and counts of cyclists crossing 50th Street increased 17 percent compared to the year before. Meanwhile, in the annual Census survey, the three-year average of daily bike commuters increased to 45,000 in 2015, up from 41,800 the previous year. Extrapolating from the Census numbers, DOT estimates that New Yorkers make 450,000 bike trips on an average day (because in general, commuting accounts for about 20 percent of all trips). 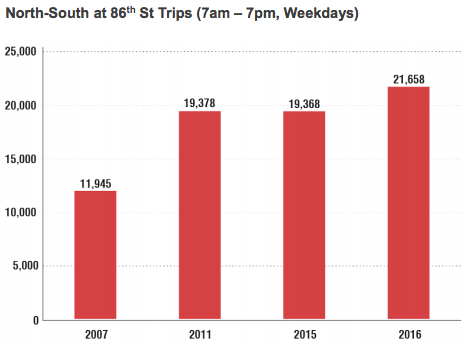 While DOT has recently said it intends to develop new metrics to track citywide cycling trends, those are not in evidence except for the 86th Street counts. With significant bike infrastructure investments underway or in the pipeline for locations like Queens Boulevard, the Grand Concourse, Bruckner Boulevard, and the Harlem River bridges, expanding the scope of the bike counts makes more sense than ever. Rumor has it that more bike count locations are in progress, but DOT said it has no plans at this time to release annual bike counts for outer borough locations. DOT released the bike count data much earlier this year than in 2016, a welcome change. But the stats would be more timely and reliable if they were released as feeds on the city’s open data portal. Last year, the city didn’t release the breakdown of Midtown bike crossings on each avenue and the Hudson River Greenway, an oversight that an open data feed would help avoid. Correction: This post originally stated that the more rapid increase in citywide biking in the Census, compared to bike counts at the East River bridges and 50th Street, indicates that cycling may be growing faster citywide than in the center of town. However, the Census numbers also show that the largest growth in cycling is happening in Manhattan, making that theory unlikely. The post has been amended to reflect the borough by borough Census data. Unless that’s a typo, I’m surprised the DOT counts bike trips crossing 50th Street rather than 59th Street. Not a typo. DOT has been counting bikes at 50th street for a long time. That means they miss those from north of the CBD traveling to locations between 50th and 59th. I always assumed it matched the “Hub Bound” data. Hub bound bike counts are the city’s screenline taken at 50th street. People want to ride and need more room to bike on the East River Bridges. Manhattan bound bike paths on the bridges are at or near capacity some AM commutes. If DOT gave QBB North Outer Roadway to bikes and South to peds and gave cyclists one of the car lanes on the Bklyn, you’d see a big bump on the ERBs. Also, how about adding some annual bike counts on streets like 34th ave and Vernon Blvd in Qns and other secondary arterials popular with cyclists in Bklyn and Bx? These core counts dont give enough info about what is happening and cover a very small portion of NYC area. In era of cheap digital video, shouldnt be too hard to expand the counts at low cost. Motor traffic on BB is down some 20% from peak a few years ago so reallocating one motor lane to more efficient transportation will not harm motorists, it will only increase BB capacity. Now, that`s a great news! We need more bike lanes and a better infrastructure for safer cycling in NYC!! !